To me, fashion has always been a form of art - there's the art from the creator but also art from the wearer in how they style the piece. Because I love the art of fashion so very much it should come as no surprise that I also love more traditional art. I think a lot of people think of museums as being stuffy places but one thing I think is so wonderful about museums is that whether your family has a gallery named after them or you bought a general admission ticket it gives us all the same exposure to art and its beauty - the Mona Lisa after all smiles no more for the Louvre's benefactors than she does for the thousands of tourists that come to see her each year. In Memphis we have several wonderful museums and places to see art but the place I frequent the most is The Dixon Gallery and Gardens. I have been a member of The Dixon for over 10 years because not only is it a place of paintings on the wall and beautiful gardens it is a place of gathering with their many social events throughout the year, a place of learning with their weekly lecture and classes, a place for families with activities for even the littlest members of your family, and a place for the community with free admissions each Tuesday - here in Memphis art is truly accessible to everyone. And with fashion and the art of wearing fashion I think it's not only how one styles a piece that serves as artist expression but how they wear something given their surroundings - A ball gown would looks silly at a baseball game but shines at a night at the theater. 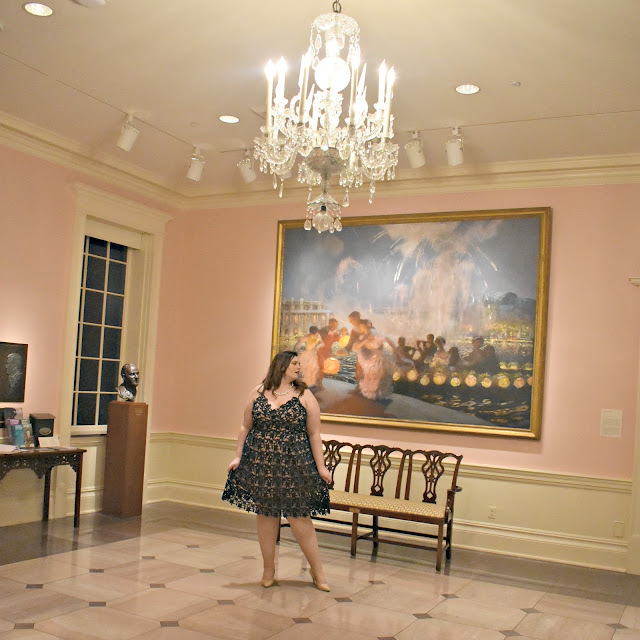 So allow me to show you some of my favorite "wearable art" pieces at one of my favorite places to experience art. I LOVE the foyer of The Dixon - it feels so grand between the gorgeous chandelier, marble floors and impressive art. This is probably one of my favorite places to snap and outfit pic when I attend events because it's the perfect setting for a dressy outfit. Here I am wearing my current "special occasion" dress - I bought this last summer for my brother in law's wedding and now that the weather is warming up I'm exciting to wear this season when I want to get a little dressed up. The team at The Dixon does a wonderful job of bringing a variety of interesting and beautiful exhibits to Memphis - currently the featured exhibit is The Real Beauty: The Artistic World of Eugenia Errazuriz and while I had a very hard time picking a favorite piece from this collection I have to go with this one because I love how the details of the dress are captured and the delicate expression on the subject's face. 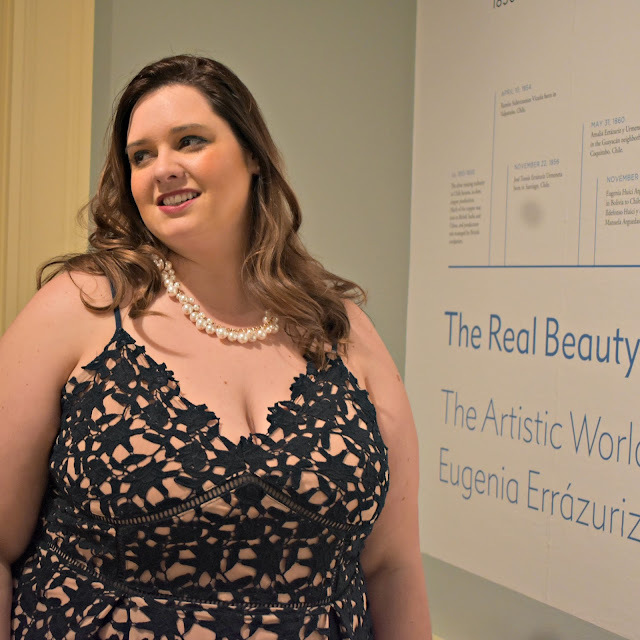 This exhibit is on display through April 8th so you still have time to catch The Real Beauty. 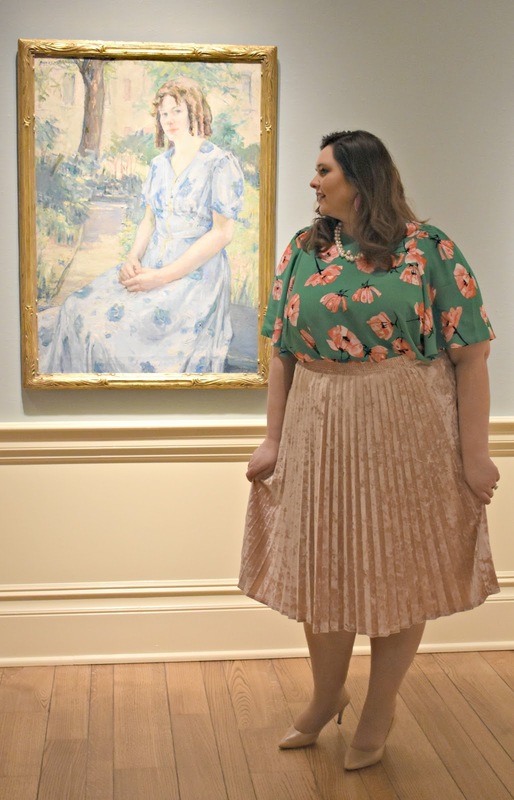 When I was at The Dixon earlier this month for the Young at Art party I noticed that The Dixon Dialect: The Susan and John Horseman Gift (on display until April 1st) had many beautiful, feminine pieces such as the ones I'm admiring here so I knew I wanted to select a soft, feminine outfit to match their tone. Is there anything more soft and feminine than a velvet skirt? I think not. I didn't plan on getting all matchy-matchy with The lady in green but I couldn't help but to laugh at myself when I saw that I had picked an top for this gallery that matched her outfit down to wearing pink earrings to echo the flower in her hair - - but that's the thing about art - it inspires us and clearly I was inspired by this piece when planning my outfits for this shoot. ART: John Singer Sargent, Mme Ramón Subercseaux, 1880. Oil on canvas. Private collection. Also on exhibit in the galleries through April 1st are beautiful quilts. For this exhibit I went with a more casual, comfortable look with a pop of color. Quilts are wonderful examples of textile art and their craftsmanship is always something that amazes me. 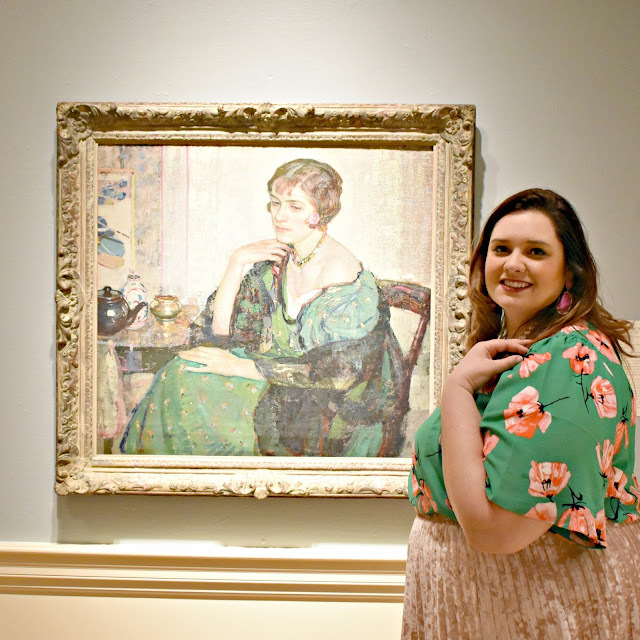 I personally find the history of quilts and their designs to be fascinating - I could write a whole post on that alone but needless to say I was very excited to see these pieces in the gallery. FASHION: Top in straight and plus size, skirt is sold out but similar available. Outside in the gardens I once again found the opportunity to match my surroundings - I had planned on only wearing this outfit inside the galleries but how could I resist snapping some pictures in the beautiful field of tulips in my tulip top? Now that the weather has gotten nice I highly recommend checking out the Food Truck Fridays and enjoying your lunch in the gardens- I did this several times when my office used to be up the street from The Dixon and I cannot tell you enough how nice it is to take that kind of mid day break. 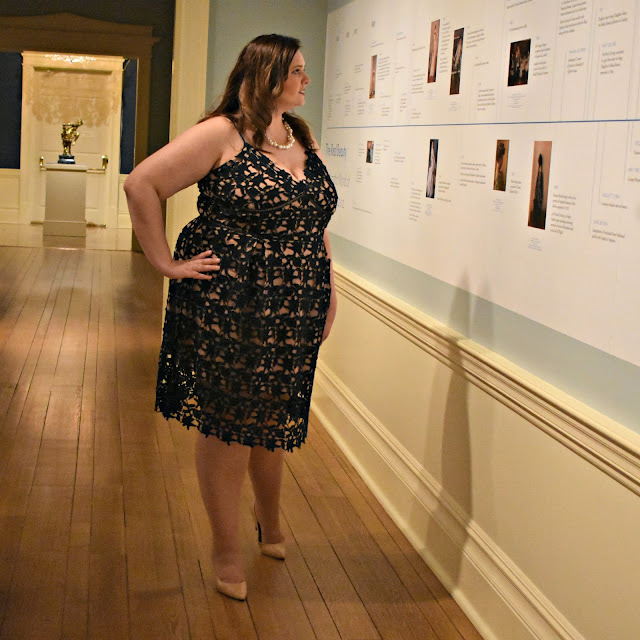 There is really so much to see and take in at The Dixon and what I'm showing here is just a tiny sampling of the beauty that awaits inside and out for your viewing pleasure.